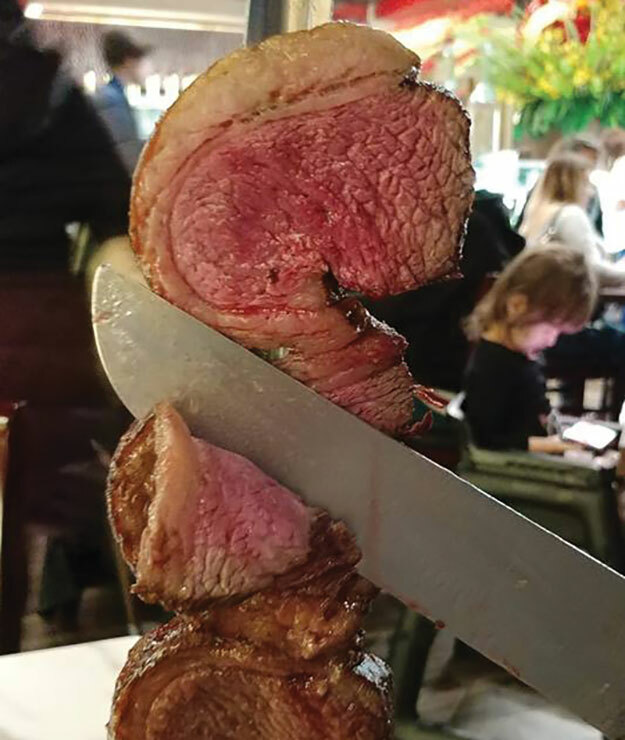 ANNOUNCER: Tacoma now has its own Brazilian-style steakhouse located at the Tacoma Mall. Dutch and Jackie battled parking to get their hands on as much churrasco cooking as they could manage. JACKIE: The morning before my visit was full of preparation. I had every intention of arriving hungry, releasing my carnivorous beast within and devouring as much meat as humanly possible. When I arrived, I discovered that a reservation is recommended and the restaurant was already on an hour wait, so I anted up to the bar for my gluttonous adventure. Here's the deal, $45 gets you the whole shebang: salad bar and meat galore shaved directly from fresh, steamy skewers the gauchos parade around the dining room with. DUTCH: Reservations are definitely required here. Not necessarily because there aren't tables available, but because you are not likely to be seated without one. I was told there was a two hour wait, but when I walked outside I was able to secure a reservation on-line for a table available in the next 15 minutes. I was seated and chowing down on a full plate from the salad bar. The salad bar requires a large appetite if you choose to try everything . . . there is just so many options. JACKIE: A trip to Texas de Brazil for just the salad bar would be satisfying alone. It's not a traditional set-up and is more like a giant charcuterie board. Loads of cheeses, salamis, pickled veggies and prosciutto are available. I skipped all of that to save room for the meats, duh. I was a woman on a mission. The herb-marinated pork loin was juicy; Picanha, the house specialty, was well seasoned, highlighted by a nice char; the Brazilian sausage had a great little kick of spice; the bacon-wrapped chicken breast fell flat for me and needed a bit more spice. The Alcatra (top sirloin) was an unexpected favorite -- it was a perfect medium rare and seasoned precisely how I'd expect it to be if I'd ordered a traditional steak entrée. Gosh, I also tried the BBQ ribs, leg of lamb, Parmesan crusted chicken and lamb chop. DUTCH: I am not ashamed to say that I tried every single choice of meat . . . all 15 of them! The gauchos just kept coming and coming with large skewers of meat for me to try. The lamb chops, Picanha, and bacon-wrapped filet mignon all deserved seconds. But it was the flank steak that was surprisingly tender on the inside with a crunchy exterior, and the filet mignon, which was so tender from beginning to end that I just couldn't get enough of. For once, I was happy to have parked far away because I really needed a walk in the fresh air to combat the meat sweats I had going on. JACKIE: My visit wasn't totally void of sides. The Brazilian cheese bread was a delight with a nice golden-brown exterior giving way to a pillowy soft chew. The garlic mashed potatoes were pretty standard and did not disappoint. The scalloped potatoes were uber cheesy, I mean, the cheesiest. My inner 5-year-old was squealing with joy. Because. Cheese. The lobster bisque left me feeling "meh" -- it was watery thin and nothing to write home about -- but those sweet fried bananas, man. They made everything better. Dutch, did you save room for dessert? Clearly, I did not. DUTCH: Dessert? I thought the delicious caramel cinnamon bananas were the dessert until my waitress showed up with a tray of sweets. And yes, I did indulge a bit. Though I couldn't bring myself to wrangle any of the monster-sized selections, I did order a glass of Licor 43 with a shot of espresso. This sweet vanilla liqueur, aided by the espresso, are intended to help with the digestion of red meat. And I had a lot of meat.